Bound Volume subscriptions to the Official Reports include the New York Reports, Appellate Division Reports, and Miscellaneous Reports, as well as Advance Sheets and Cumulative Tables and Index pamphlets. Approximately 19 Bound Volumes are issued per year including two Interim Volumes for NY3d. Cases are released in	weekly soft-cover Advance Sheets prior to their inclusion in the Bound Volumes. The Cumulative Tables and Index pamphlet, released every two months, contains a Cumulative Table of Cases, Cumulative Table of Statutes, and Cumulative Digest-Index covering all opinions and memoranda reported in the Advance Sheets which have not yet been printed in the Bound Volumes. 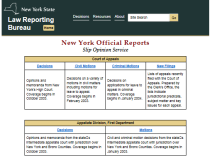 The New York Slip Opinion Service provides access to recently released decisions prior to publication in the Official Reports, together with an electronic citation for each decision. Opinions selected for online publication only are also available. The New York Official Reports Service provides access to the text of all decisions published or abstracted in the Official Reports from January 1, 1956 through the latest Advance Sheet. The Official Reports are published online by a commercial vendor, currently Thomson Reuters Westlaw. 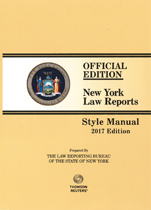 All opinions published in the Official Reports conform to the New York Law Reports Style Manual, which is prepared by the Law Reporting Bureau and approved by the Court of Appeals. It is available in HTML and Adobe PDF format; information concerning the availbility of print copies may be obtained from the Law Reporting Bureau by email (LRBpublications@nycourts.gov), phone (518-453-6900), or mail (17 Lodge Street, Albany, NY 12207).